The Nobel Prize for physiology or medicine has been split two ways for groundbreaking work on parasitic diseases. William C Campbell and Satoshi Ōmura found a new way of tackling infections caused by roundworm parasites. Youyou Tu shares the prize for her discovery of a therapy against malaria. The Nobel committee said the work had changed the lives of hundreds of millions of people affected by these diseases. The mosquito-borne disease malaria kills more than 450,000 people each year around the world, with billions more at risk of catching the infection. 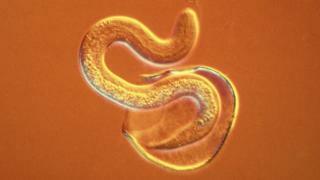 Parasitic worms affect a third of the world's population and cause a number of illnesses, including river blindness and lymphatic filariasis. After decades of limited progress, the discovery of the two new drugs - ivermectin for river blindness and lymphatic filariasis, and artemisinin for malaria - was a game-changer. Efforts to eradicate malaria had been failing - older drugs were losing their potency - and the disease was on the rise. Prof Youyou Tu, who in the 1960s had recently graduated from the Pharmacy Department at Beijing Medical University, looked to traditional herbal medicine to find a potential therapy. She took an extract from the plant called Artemisia annua, or sweet wormwood, and began testing it on malaria parasites. The component, later called artemisinin, was highly effective at killing them. Today, the drug is used around the world in combination with other malaria medicines. In Africa alone, this is saving more than 100,000 lives every year. Tu is the 13th woman to win this Nobel Prize. She shares the award with two men who found a treatment for another parasite - roundworm. Their research led to the development of a drug called ivermectin, which is so successful that roundworm diseases are on the verge of eradication. Satoshi Ōmura, a Japanese microbiologist, focused on studying microbes in soil samples. He selected a number of promising candidates that he though might work as a weapon against diseases. Irish-born William C Campbell, an expert in parasite biology working in the US, then explored these further and found one was remarkably efficient against parasites. The active ingredient, avermectin, went on to become a drug known as ivermectin which is now used to treat river blindness and lymphatic filariasis. River blindness is an eye and skin disease that ultimately leads to blindness. Lymphatic filariasis, also known as elephantiasis, causes painful swelling of the limbs. Both affect people living in some of the poorest countries in the world. Dr Colin Sutherland, of the London School of Hygiene and Tropical Medicine, said it was immensely gratifying that the achievements in tackling these important diseases had been recognised. "It's come out of the blue but we are very excited that the committee recognised the importance of parasitic diseases." The Nobel committee said: "The two discoveries have provided humankind with powerful new means to combat these debilitating diseases that affect hundreds of millions of people annually. Omura told Japanese broadcaster NHK: "I have learned so much from microorganisms and I have depended on them, so I would much rather give the prize to microorganisms. "This is kind of a low-profile research area, but microorganisms are extremely important for humans. They can be our partners. I hope the area gets more attention because of the prize so that it can further contribute to human beings."